We went out this evening to celebrate the Stable Sprites 51st birthday and Tracey's 21st. A lovely evening at a local pub stuffing ourselves and not having to bother about the washing up. 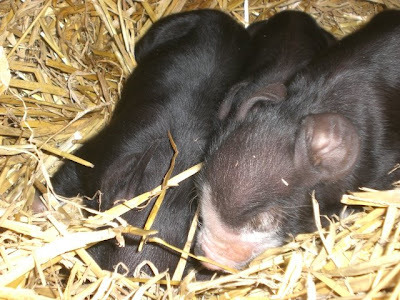 The highlight of the evening for me wasn't the pudding but seeing these little Berkshire Piglets who are only hours old. They are snug in the Stable Sprites cathedral like stable block, hardly enough room to swing and elephant, with their mum who was doing a grand job of looking after them while we were there. The poor summer continues to assist the pigs in their attempt to be the last ever pigs accommodated in the really useful space/barn at the end of the garden. 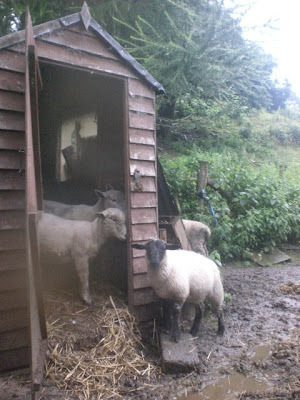 Not content with digging their way through the wall of the old sty they have, with the help of the rain, caused a huge landslide through the door facing the hill. Tons of mud has surged through the opening raising the floor inside around two feet in places. This has caused a frantic search for a dryer bed so they have dug underneath the separating wall (in the video above you will see daylight shining through the new gap) only stopping when the old oak beam gave way so collapsing the escape tunnel. To reward their efforts I gave them a new bale of straw tonight and here you can Blodwyn giving it the once over. 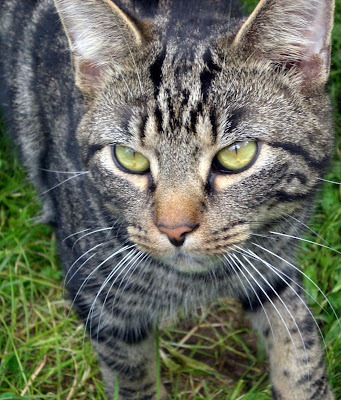 This is Earl, who we think has become part of the food chain somehwere. I spoke to The Oracle and to the Technohermit tonight but neither have seen him. This is Lilly, a lovely Merle collie we are looking after until she goes to live with a smallholder from Dover way. 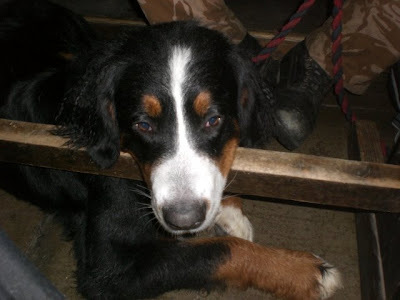 She is very attentive and tries to shepherd the other dogs, tonight she found a vey cosy spot to keep watch. Meanwhile Geisha is doing her best to eat her way through. We are beggining to think that one of our cats has fallen victim to the fox. The birds are no longer free range, we looked at a picture of the yard from January and discovered we only had one bird out of the fourteen pictured. 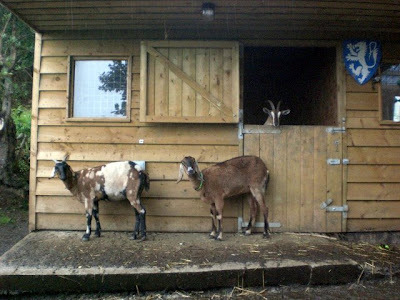 They are now safely housed in the goat houses and let out when we and the dogs are out. The fox or foxes have visited us several times recently, Molly the long range Muscovy duck vanished leaving a clutch of eggs under the holly tree, we even saw one last Friday and its at that time our cat disappeared. Now these cats know when they are on to a good thing, unlimited hay to sleep on, breakfast every day, all the rabbits you can eat. They have it so easy that they seldom wander out of sight of the house, and they are usually paired up. The other three have been acting weird as well, staying indoors and not taking your hand off when you offer to stoke them. We live in hope but he has been gone now for six days. With all that's been going on you might be wondering whats happened on the garden and animal front here at Rock HQ so here is a quick update. The garden has started to yield produce and meals are actually appearing on the menu that involve only our produce. This is provided the meals comprise of a combination of tomatoes, onions, garlic, courgettes, potatoes, chicken, duck, bacon, ham, venison and pork. The last of the sausages were eaten on the weekend which is a worry considering the freezer held over sixty pound of sausage three months or so ago. 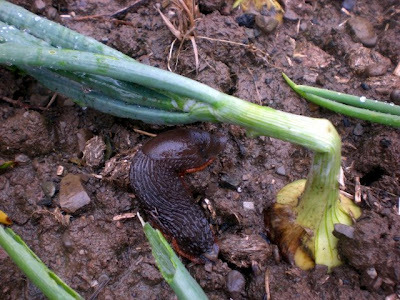 The onion bed has been savaged by slugs, yesterday afternoon there were over a dozen beasties like this one busily devouring the onions. A quick stab with a blade and they were dealt with but the damage is huge, you can see from the picture some stalks have been completely chomped through. The sheep are out on the hill again after the reminder of where they live, all the lambs have a date with Mr Whirlpool in the next few weeks, lack of sufficient room has spared them for a while. 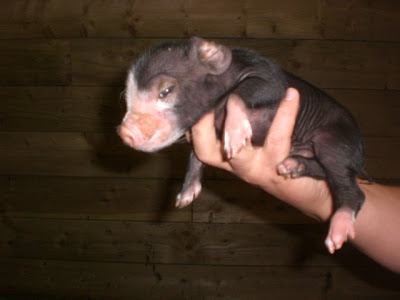 The pigs are getting bigger and very unruly. Their escape from the pen thwarted they have turned their attention back to me. You take your life into your own hands as you enter their territory with the feed buckets. Now the Stable Sprite will argue different but I think its because there are boars in the pen, there is an air of tension in the group, the only other difference is that there are five instead of four. So the plan is to separate the boars away and fatten them a bit quicker so they can be dispatched quicker. Once upon a time there was a Little Green Pressure Washer. He was a very happy Little Green Pressure Washer, living in a smart new house with a block paved drive with parking for four cars and a shiny blue motorbike. Every week he would help The Man clean the drive and sometimes, if he was lucky the Little Green Pressure Washer would get to clean the big motorbike. Life could not be better. Then one terrible day The Man carried the Little Green Pressure Washer from his cosy cupboard in the gym and put him in a van where some rough types just dumped him in an old barn. With spiders. Wondering what he had done so wrong. The The Man appeared and carried the Little Green Pressure Washer along a lane and left him in a caravan along with other power tools. This was very frighting for the Little Green Pressure Washer and he waited quietly for The Man to start using him again. Some of the other power tools didn't make it. They were chewed by dogs, or got wet, or crushed, or all three. The Man appeared again and took the Little Green Pressure Washer out of the caravan and put him behind the duck shed while he cut the caravan into bits and threw it away. An old bin was thrown over the Little Green Pressure Washer and he was left in all weathers to fend for himself. The Man appeared once more and removed the bin, the Little Green Pressure Washer really hoped he had been forgiven for whatever it was that had made The Man so angry that he had been left outside a year. For a moment it looked like the end for the Little Green Pressure Washer as The Man carried him over to a skip, but The Man is a bit of a hoarder and could not quite bring himself to throw the Little Green Pressure Washer away. He put him, none too carefully at the back of the shed, for another year. The Little Green Pressure Washer watched quietly as The Man crashed around the shed until he found him on the shelf, in a cage with broken tools. 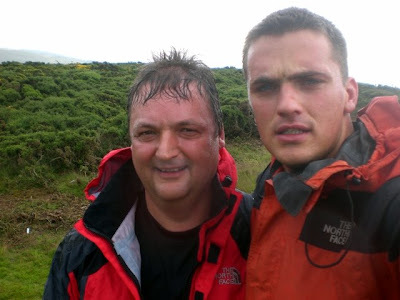 The Man carried him outside, it was all different. 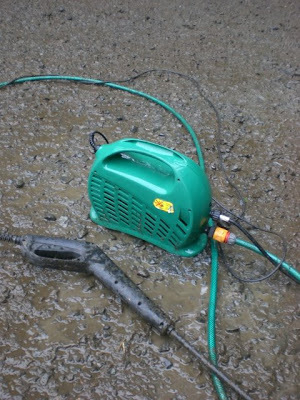 The Little Green Pressure Washer could see a new building surrounded by a sea of mud. 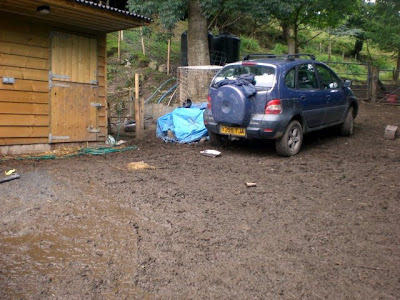 The mud was very deep and mostly had fallen out of animals bottoms. The Man plugged him in and to everyone's surprise the Little Green Pressure Washer burst into life. Even more surprising was the fact that the man, not renowned for his tool care, found a hose, a tap fitting and a special connector to fit the hose to the Little Green Pressure Washer. Seconds later a huge clean area of gravel appeared as if by magic, the Little Green Pressure Washer was going to show The Man how useful he could be and then he would be looked after. Perhaps. Four hours later The Man had uncovered the 40 tons of gravel put down in the yard last spring. He was very happy with the Little Green Pressure Washer, so much so that he cleaned him and put him away safely in the dry. Out of reach of the dogs. And rats. Given the emotional turmoil of the last few weeks and the fact that we had spent the day in Worcester working on a recruiting stand Tracey and I were looking forward to trying out our new bed. 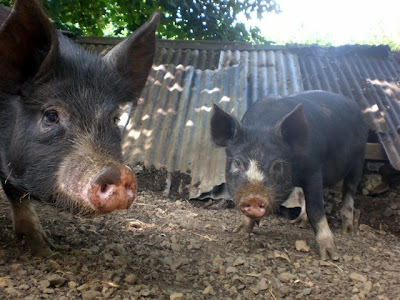 Smallholders find, unlike their non smallholding colleagues that the weekend is not a time of sleepins but a time of less sleep as you inevitably go to bed late and get up earlier. We decided that we would, no matter what sleep in on Sunday morning. Saturday started extremely early saying goodbye to Ben, we then did our round and fed and watered the beasts before getting ready to stand in Worcester City centre handing out leaflets. We saw more people in five minutes than we would normally see in a week in our local town. Quite why the modern British male chooses to wander the streets demonstrating he has the dress sense of a 14 year old American teenager is beyond me but we persevered at our post and in four hours handed out 500 leaflets. Back on safe ground at Rock HQ a few odd jobs were done and it was bedtime. 12 hours ahead of restful sleep on the new mattress. Initially the dogs had other ideas. The puppies camped out on the stairs instead of their beds and as I began to drop off I hallucinated giant rats gnawing the bedroom door. 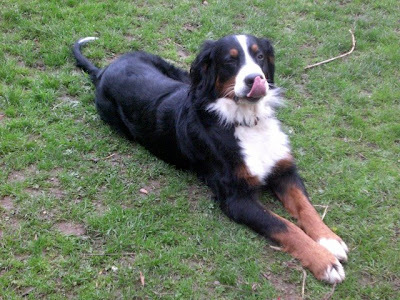 Not quite, but a Berner pup decided to have another go at the stairs. Several tellings off later they beat a retreat and an uneasy silence descended on the cottage. This was soon broken by the outside dogs baying, in full cry, which could only mean one thing. Fox. Tracey and I took it in turns to hang out of the bedroom window, remonstrate with the dogs and scan the darkness for anything fox like. Nothing. Two am brought a new sound, akin to a cat being run through a mangle backwards. This went on long enough for me to decide it wasn't going to stop, get my boots on, unlock the workshop, find the gun, turn on 3 security lights and get off five randomly aimed shots in the general direction of the mayhem. It was foxes fighting in the field directly in front of Rock HQ, probably cubs wandering round dispersing or a fight over territory. Once I was sure they had got the message I reclimbed the wooden hill and threw myself onto the very comfortable mattress. Sleep finally overtook me right until half five when the dogs started again. I toughed it out until seven with a pillow clamped over my head when I relented and got on with the day. Which has, despite having one of those nights been a great day. 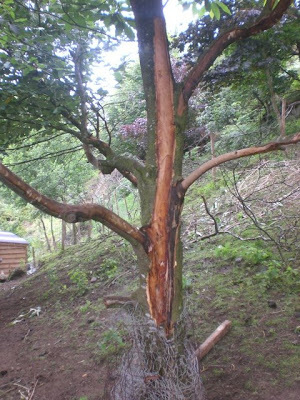 Everything went according to plan, a major job got done and we went and collected Tracey's new charges, pictured above. 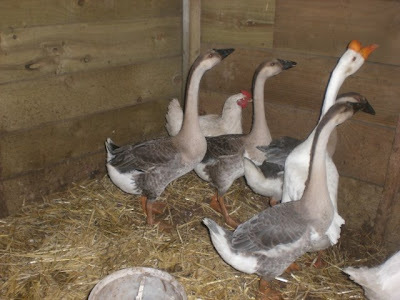 A Chinese Gander called Sunny ( a husband for Sally) and four grey Chinese Geese, a Gander called Thunder, then three geese called Storm, Gale and Cloud. Sally instantly fell webbed foot over wing tip in love with Sunny and has been flirting with him endlessly. This might seem incongruous given the fox problem but they are secure in one of the goat houses until a special duck and geese pen is completed in the garden next week. Next weekend we start a weeks leave, and there are big plans afoot that will completely change the way Rock HQ operates. So much happens at Rock HQ its hard to keep up with events. For instance in the last twenty four hours the old car and van have gone to the great re cycling plant in the sky,I made our bed, spoke to the BBC about a programme they are making involving fostering (they are apparently sending me the scripts to look at, a daytime TV programme called Doctors) tried to speak to another BBC researcher about a smallholding programme they are planning and a five bar metal gate fell on Springtime nearly squashing her flat. Luckily Tracey was on hand to free the dazed and confused sheep. Making the bed was not a simple task when it arrived wrapped up in bubblewrap and sticky tape. years of making Airfix models meant that the A5 sheet of paper containing hundreds of sketches of how to bolt G to subframe J and crossmember underhanger 19.4 x 7 was no match for me and within two hours, under Tracey's patient supervision the whole thing was assembled. There then followed a titanic battle of wills, ours versus the new mattress which refused to cooperate and go upstairs. Eventually it was beaten into submission and installed in its rightful place. The old one is currently in the conservatory, its fate uncertain. It was going to the tip as it was so uncomfortable to sleep on it forced its replacement. I found this hard to accept as it is a very expensive make, the one with the hippo and duck label where they both sleep peacefully without the hippo ending up with the duck as a badge on its jimmers. As we battled to get the old one downstairs I found a very interesting label which basically translated to "this way up" meaning for the last year Tracey and I have been sleeping with it upside down which might explain why it was like sleeping on a metal grid. The right way up at the bottom of the stairs and it was back to being supremely comfortable. It was Ben's last day with us until sometime in December (he is going somewhere very dangerous beginning with the letter A, they make nice rugs) so I took the day off to spend some time with him. After running through several options for the day we settled on some endurance training. This entailed setting off at a brisk pace across the ridge, with heavy packs and two Bernese Mountain Dogs as company, in the summer rain. Once at The Whetstone we climbed onto it and began drinking whiskey. Task over we managed to make it to a pub where we introduced the locals to the largest border collies they had ever seen and continued our endurance training by trying all the beers. It being a real ale pub there was a lot to choose from and after two and half hours of serious hard work we emerged into the sunlight and walked back to HQ. This took longer than it should thanks to several seemingly good idea detours and an encounter with one of the local militia who wanted a chat to break the monotony of his day. 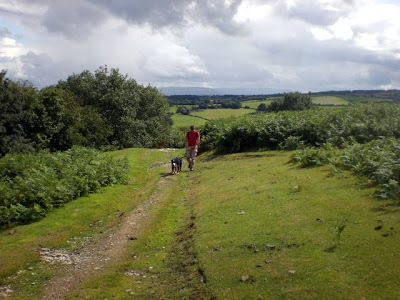 By the time Ben and I were on the top of our hill it was almost tea time and after a final whiskey we set off down the insanely steep North Face Gully, disturbing a large dog fox sneaking up on our smallholding in the process and getting home just five minutes before Tracey did. A quick shower and we were all off to the pub, how we managed to fit into Tom's car without bursting it at the seams is as big a surprise as how the poor cars suspension managed our combined weight but soon we were at The Harp dining on the best steak a human being can find. Goodbyes were saved until five this morning when Ben donned his uniform and prepared to leave. It was hard not to get emotional about him leaving but as we agreed a long time ago, there really is no point worrying. He loves his job and whatever he does he will do it well. All of us are immensely proud of him and we all look forward to him coming home safely. These two stout fellows have never heard of health and safety. They turned up tonight and removed the two poorly vehicles that have waited patiently in the lane for their owners to fix them. They have been forsaken for better, swifter, better looking charges and so have been condemned to the scrap yard. Hopefully they will be re cycled as baking trays or door hinges, whatever happens to them they wont be getting in our way any more! 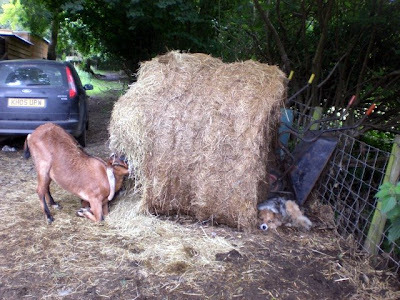 There are many surprises in the life of a smallholder. 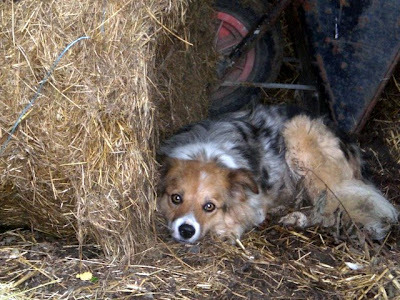 Tonight as we drove along our lane we found Archie stuck fast in the stock fence, again. In fact he was stuck one square below where he got stuck a week ago. The other surprise tonight was the hermit, who has featured heavily in our lives this week, who leapt from the bracken in front of our car clutching a parcel. Thrusting it through the window he asked if we could cook these for him. Tracey cautiously opened the bag, a box within contained Chicken drumsticks. He stepped back and grinned. As its Wednesday it would be a day we take him a meal, but him specifically requesting we cook his own food is a first. Tracey and I stared at the bag, "All you got to do is add taters" he continued before disappearing back into the bracken. Anyone remember the Aesop's fable stone soup? Don't stop til you get enough! 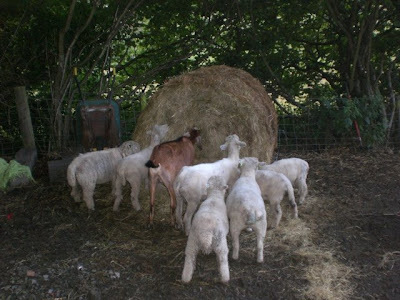 The flock have discovered there is a new bale in the yard and have set about it with enthusiasm. A strange twist to the Technohermit sage last night. The phone rang at 10.15 pm and after the compulsory who's that conversation it was finally decided that I should answer the phone in case it was burglars. It was in fact worse, it was The Technohermit ringing to tell me that he had hurt his shoulder. Really bad. In fact he couldn't move his head, left or right. For a few hideous seconds I wondered whether he was phoning to ask me to go around and massage him but thankfully it was just to ask advice. Take two paracetamol and lie down. Not convinced of my healing powers or medical advice he reluctantly said goodbye. In the background I could hear the TV speaker straining to cope with the volume setting. He didn't phone this morning so I assumed all was well. By home time I was convinced he was lieing down in his hovel unable to move so first job back at Rock HQ was to do a Hermit welfare check. As I climbed up the track to his den I could clearly hear the theme tune to Emmerdale. He shuffled outside once I made myself heard. He was fine, taken 3000mg of paracetamol and couldn't feel a thing. Hopefully he has run out now. We shall see when I take his dinner around tomorrow. We have had many strange evenings here at Rock HQ since we began our smallholding adventure, like the time thirty or so Orthodox Jews turned up in our yard, complete with all the gear, or the paramedic looking for an old man (not me) not to mention the predicaments the animals get into, far too many to list, but it all adds up to full and interesting lifestyle. Tonight's turn for the surreal involved The Technohermit and a broken TV. Yesterday when I dropped his meal off I was not in the best of moods, a combination of tiredness and hunger made me feel less than inclined to go around the bonsai mountain we live on to drop off his Sunday roast. One word about lateness or him not getting enough roast spuds and he would be wearing them. 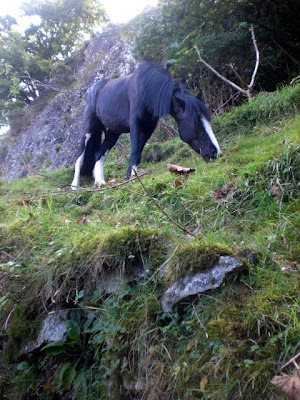 He has the knack of surprising me when I get there, usually by appearing suddenly from behind me or jumping naked out of the bracken. Unusually he was waiting quietly by his gate with a big beaming smile, as I approached he gripped my arm and thanked me profusely for the help we had given him, he wasn't used to having good neighbours. This lowered my guard obviously because I heard myself say "Don't worry I will be around at seven tomorrow"
Seven tonight found Tracey and I outside his lair armed with wire cutters and a length of TV aerial cable. His TV wasn't getting a good picture, not sure why, maybe the aerial, maybe the cable he didn't know. The TV was wired into an assortment of car batteries charged from the generator. The screen was a fuzzy mess of black and white snow with a deafening roar from the speakers. "I cant get no picture! 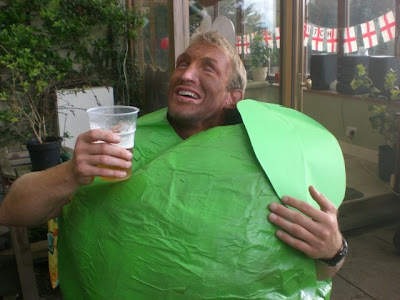 "he shouted "Bin like that all weekend!" Finally I managed to turn the volume down and once I stemmed the blood loss from my ears I set about the task of reconnecting the aerial cable in the dim light of what appeared to be his bedroom. The sense of rising panic caused by my location mixed in with my inability to see wasn't helped by his inability to hold the torch steady and so the simple task of rejoining the severed co-ax seemed to take forever. There then followed a comedy of errors involving a 70 year old hermit, a ladder and a rusty aerial, him asking if there was any picture as he turned it, my cries of NO! relayed by an ever patient Tracey back to the aerial tweaker. "Not good?" he sounded surprised, incredulous would a be more accurate description. "No" I began, then I had a sudden sinking feeling, an hour as a TV repair man was wearing thin, "Was the picture like this before?" I asked, I had a suspicion I already knew the answer. "Like that when it was broken?" "That's what it was like before? It was always like this?" "This is how you watch telly?" I turned to leave, Tracey was still relatively safe outside. "I cant hear it now though" he shouted after me, "I mean I got a picture but I cant hear it"
I paused in the doorway, looking over my shoulder I could see his face lit up by the struggling TV full of concern over the lack of sound. I turned and reached over and slowly turned the volume switch back to its previous deafening level. William is acting as our lawn mower for the next 24 hours. Looks like he has other ideas though pictured at the base of the cliff, good job hes so sure footed! As parties go last nights effort at Rock HQ was a great success. Although smaller than usual, no one inhaled sausage and collapsed their lung, no sword fights got out of hand, no drive by shootings happened, the music didn't upset the neighbours dogs and the weapons grade pyrotechnics didn't set fire to the trees or cause the emergency services to respond (as at previous parties) and the minor mishap when the smoke filled house had to be evacuated as an effect similar to those used by Led Zepplin on stage backfired and as well as creating an ethereal mist in the garden filled the cottage with a poisonous but otherwise entertaining fog. 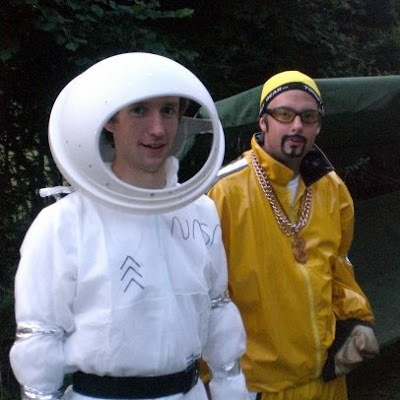 Much praise needs to be given to those who put so much effort into their costumes, and we were delighted when Ali G made a guest appearance. Others included apples, dictators, Arabs, aliens, astronauts, Aladdin, Alice, archers, Animal from the Muppet's, Amy Winehouse, some Taliban, alter egos and others too numerous to mention. I knew my wearing a label with "What A am I?" on it was a risk and I lost count of the number of times the immediate response was the slang for a particular piece of usually well hidden human anatomy. The food was donated on the main by Patches who gave a leg of ham and Pixie who gave a whole shoulder on the bone. Pork Butts and taters proved extremely popular (see Wren and Stimpy to find out what that is) Just before I finally ran out of steam at around three am I collected the remains of the meat and put it in the fridge for safe keeping. Breakfast time came around far to quick and Ali G who forgot his Ritalin woke the house up at approximately seven am. While they tidied the garden and cleared the wreckage of the party I set about cooking lots of bacon rolls. The left over pork was on the top shelf and I momentarily considered using that for breakfast but settled for the bacon. Whilst cooking Ben, still dressed as Adam Ant wandered in and informed me that hey, guess what, last night I decided to have a chew on the leftover pork bone and I was wandering around biting lumps off it for ages before the lads told me they had "rescued" it from Reba who had taken it from the table and was under a tree eating it. Great, now its in the fridge. Bacon rolls and coffee served to the recovering hangover victims Ed, the astronaut, looks at the rolls and asks whats the vegetarian option. My reply, short and too the point. This is Reba looking particualrly pleased with herself as she has just finished breakfast. She was a bit surprised to be fed at 5-35am but its an early start here today as, in the words of Jack Nicholson, "Its Show Time!" We are holding a party for Ben and a few of his well behaved cronies to say goodbye as he is being sent to a war zone beggining with the letter A. So the party theme is dress up as anything begining with the letter A. I am just wearing my normal attire as being an arachnophobic I already qualify, Tracey is dressing as an angel which is also pretty apt. As usual Ben has been an immense help in setting up the party, which is why we are up so early. It was going to be a barbq but given the weather forecast its a disitinct possibility that we are going to be seeking shelter from summer in the workshop. One thing he has got right is to buy two barrels of beer which will undoubtedly make any venue the best party ever. The meats roasting in the ovens, all thats left to do is clear and decorate the workshop, assemble the gazebos and find a way of ensuring they dont blow away into the next county, cook a ton of potato salad, make coleslaw, pate, keebabs, burgers, tidy house, feed animals and whatever else needs doing. Should be a quiet day! At last, proof that goats can be useful! Maggie clearing some of the stinging nettles from the drive. It must hurt. Surely! But then again its going to take a lot of nettle clearing to make up for the damage to the sweet chestnut tree she caused earlier this week! 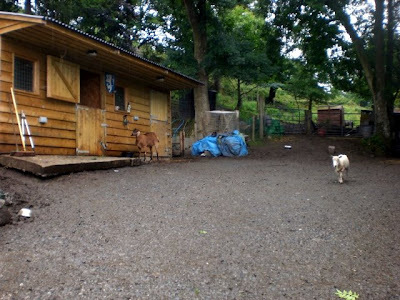 It was raining so hard tonight even the goats gave up chasing the feed buckets I was carrying and instead hid under the eaves of the stable. The sheep took cover in various places, this is Easter and Springtime in the duck shed with Burgers thinking of joining them. Its been a busy evening at Rock HQ. After promising never to fill the workshop with junk again I realised that it was in desperate need of retidying up when I opened the door and a sofa fell out on me. I'm not sure where it all came from, perhaps there are workshop sprites that create it while we are out but somehow the access to from the outside double doors to the doorway into the pantry could not be negotiated without a guide. Quite why I had stored broken buckets, old card boxes and broken furniture rather than throw it away from the start is beyond understanding so Rene was press ganged into service as a rubbish wagon. Most useless items were bagged up, some were moved from the workshop and into the garage on the just in case principle, just in case I decide there is a use for a broken wooden washing up rack or a chain mail vest I started making 15 years ago. At one stage I had moved so many items to the just in case its useful pile I began to wonder if I was actually tidying up or merely moving mess from one place to another. By mid evening I had got to the stage where visibility from one end of the workshop to the other was possible and the noise from the critters reminded me that they all needed feeding and watering, as did The Technohermit so I had to stop. Feeding has been sped up since the horses were given a large bale of hay to munch on. The Stable Sprite dropped it off at the weekend confidently telling me that it should last the month. Its survived five days so far and has shrunk to less than a third of its size. 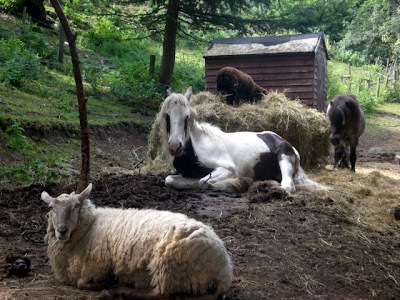 Three ponies and 18 sheep lie around it with a I cant move I'm so full expression on their faces. Its a good job The Stable Sprite didn't mind delivering it because given the current rate of consumption we are going to need another on this weekend! The heaviest rainfall yet at Rock HQ, totally overwhelms the guttering on the conservatory and a new stream appears in the lane. Luckily I had finished the outside jobs before it started! I'll find my way home! A nice surprise was half asleep on the doorstep when we got back to Rock HQ today. 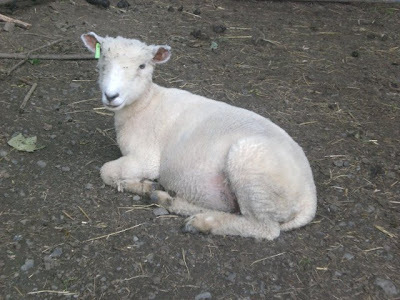 Daffodil, our bottle raised ultra tame year old ewe/lamb, missing on the hill for at least a month was curled up waiting our return. Confusion reigned for a few moments as we went through the is it isn't it routine, she seems to have grown more ear since we last saw her, but with number 9 on her eartag it was definitely her. After a bit of fuss she wandered through the conservatory, explored the garden before settling to join the rest of the flock on Oak Bank. I was very happy at her return, the novelty of having to roam the hills every other night shouting her name whilst carrying a bucket of sheep treats was wearing thin. Something that is in short supply when Joan is searching for her Mum. Showing me where the fence needs repairing. Tonight was bar b q night ! 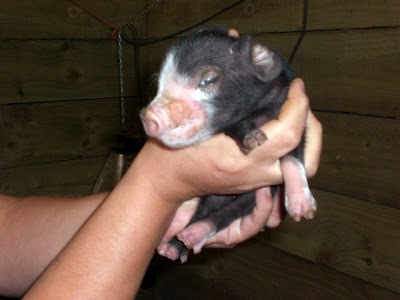 Having to conceed defeat to these piglets was not easy, they have all day to dig out the foundations of the old sty, whereas I only have a limited amount of time to shore up the defences from the inside. A huge hole appeared two days ago and Jewsons didn't have enough building material to fill it so I tactically withdrew from the battle. The result of all their snout work has now got them into the old sty. I therefore barricaded the old sty door, which is in fact a nice inch thick newly built door that's four foot six inches high and three foot six wide, yes yours truly can sometimes build something that lasts longer than a lego model in a doctors surgery. The result of all their efforts has gained them an extra nine foot square. They seem to have lost the urge to dig out, perhaps the disappointment of finding an empty room after all their digging has put them off. This is Roxy, wound from the crows clearly visible, but its not putting her off scoffing the sheep nuts scattered for dinner. Very pleased to say she looks like she is making a full recovery, it takes a lot to put a Ryeland off eating. Apart from a badly cut backside and a nasty wound in her side she appears to have got through her mishap quite well. Her muzzle is swollen for some reason but as you can see shes holding her own with the rest of the flock so alls well. 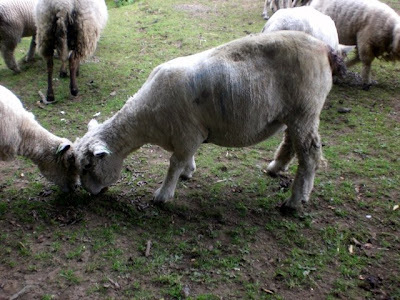 Its been a bit of a week for sheep at Rock HQ and tonight gave us a new situation to deal with. Roxy the white sheep closest to the camera was missing from the flock when they had their dinner tonight. At first I thought I had miscounted, but I kept arriving at the number 16, even with Burgers included in the flock we were short one sheep. Daffodil is on the hill somewhere so I convinced myself I had miscounted and set about the evening chores. I carried a bucket of horse nuts up to the boys and in a depression by the fence I found Roxy upside down legs in the air. Now sheep have an incredible capacity for self harm and rolling onto their backs legs in the air is a sure fire way of killing itself. The weight of internal organs, the buildup of digestive gases makes it impossible to breathe. Not only that but they are them easy meat for predators like crows. 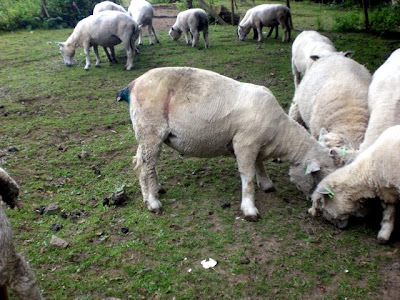 Roxy was at the sheep's equivalent of the pearly gates and was bleeding from a nasty wound on her bum caused by crow beaks. Somehow she had managed not to lose her eyes. I rolled her over and helped her up, leaving her to stagger around like an extra from a horror film while I went back to HQ to get a long wide hypodermic needle to puncture one of her stomachs to let the gas out. She was still breathing when I got back and soon she was making a noise like a comedy balloon as I punctured her rock solid side. The smell sent the dogs running for cover and it was only the fact that I was kneeling down that saved me from keeling over. Roxy burped which added to the noxious fumes surrounding us but at least her breathing changed from rapid and shallow to slow and deep. By the time I had coaxed her down the hill the build up of gas needed release once more but she seemed a bit brighter. Tracey braved the poisonous cloud enveloping Oak Bank and helped with the first aid on the stricken sheep's backside. A quick squirt of magic blue spray would prevent infection. An hour later she was with the rest of the flock and appeared to be chewing the cud. She might make it, it looks promising at the moment. That's where I have been tonight in pursuit of our last missing sheep, Daffodil. No sign of her. The expedition carrying a bucket with some sheep nuts in to tempt her from the undergrowth did have several unforeseen consequences. 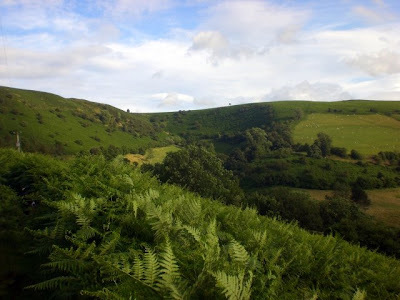 I took a "shortcut" down North Face Gully, a near vertical slope that would have cheese chasers quaking which ends in a rock face, easy to negotiate, not so easy carrying bucket and having forgotten the six foot high bracken hid the safe exit. 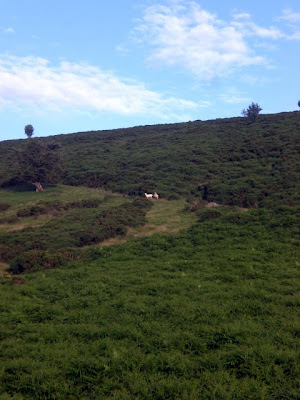 Having stumbled through said bracken fairly safely the sight of my head apparently floating in a sea of greenery approaching from an entirely new angle freaked out Apollo and William who were grazing peacefully. They, on seeing my head, ran away and hid in the blackthorn bushes and nettles further along. It also made me very late to take Mad Keith his dinner. In my haste to take him his roast pork and veg I slid Rene in the one foot deep muck and mud that pretended to be our yard and crashed into the side of Fifi the Focus wounding her front nearside wing. The reward for m altruistic efforts was an ear bending from the technohermit for being late. 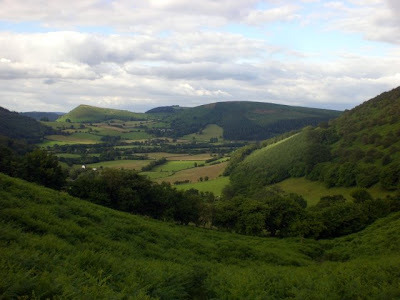 Tomorrow I plan another foray into the wilderness to find a lone Daffodil. 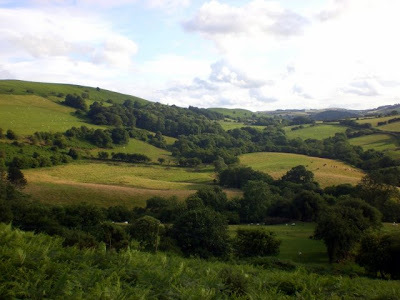 ..the hillside showing the common land above the fields (its the dark green unkempt bits at the top) with the sheep grazing happily. I zoomed in across the saddle of Fiveways crossing, two white dots had a familiar air about them. 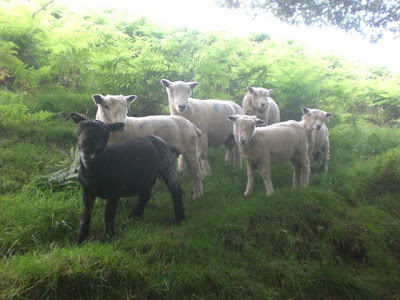 Like Burgers, our sheep, unrestrained by fences and hedge, sometimes have a tendency to wander and get confused, joining the hill sheep, going native as it were. Becoming pie filling later if not rescued. With only five hundred plus acres to run around can anyone guess how long it took me and four untrained but enthusiastic dogs to persuade Meg and Hercules to come home? 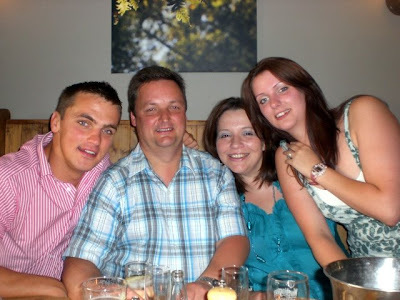 Today was Tracey's Dads funeral, a sad and joyous day. Sad because we mourn the loss of a her father, joyous because we celebrated his life. A poem was read called "When I'm Gone" which fitted the mood perfectly. 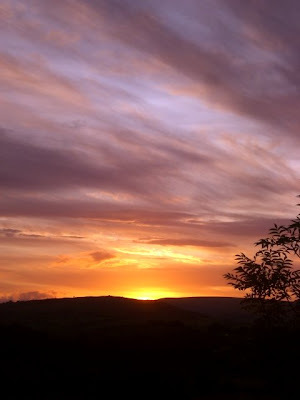 Its sentiment and theme is one of fondly remembering loved ones who have gone at the simplest of prompts, in the wind that ruffles the young wheat, the sun that glances on the window pane, a bonfires smoke against blue twilight, its at times like these we remember. It was not the easiest of days, there were many tears, and when we left the crematorium the sun broke through the clouds, the wind blew through the leaves and a family of ducklings wandered across the lawn. We remembered the words of the poem, but most of all we remembered Derrick.